In the Integration Series 1 Overview, Luis Cortes (@licortes_redhat) described the integration series and the 4 use cases that we will be showing. As you can see in the diagram to the right the integration series shows how to use Fuse as the integration platform to bridge Salesforce-SAP-Feedhenry. It is a common scenario in enterprise customers that records of potential customers (aka prospects) are not a part of the customer database used by other applications (such as ERPs) until they become customers. The first Use Case that we will explore is Salesforce to SAP. When an opportunity is closed in Salesforce then a customer record is created in SAP. View the web browser with SalesForce page with info on the opportunity “Acme Consulting”. View the web browser with SAP customers screen, we search for “Acme consulting”, it dos not appear there. In order to use the test code to run the use case you must have completed the simple demos with the components in order to have the accounts and server side setup correctly. The Salesforce Component and SAP JCo Components will be used with Use Case 1. First import the first use case into JBDS. Let's take a look at the pom.xml which will contain the dependencies for the Salesforce and SAP JCo Components. Now we will examine the Camel-Context.xml. First we are setting up the requirements for Salesforce and then the requirements for SAP. We subscribe to the CamelTest Topic to listen for changes to Opportunity Objects. Any that have been modified to 'Closed Won' then create the Customer from the Opportunity Name (in the future we could grab the Account Name) in SAP. Then we grab the customer list back from SAP and can verify the customer was created. <xmljson id="xmljsonWithOptions" forceTopLevelObject="true" trimSpaces="true" rootName="newRoot" skipNamespaces="true"
The properties used for salesforce are in the salesforce.properties file while the properties for SAP are in the camel-context.xml. Step 7 - The route will show the Closed Opportunity is picked up and the customer is created in SAP. NPM is the pre-installed package manager for the Node.js server platform. It is used to install Node.js programs from the npm registry. The package manager allows publishing and sharing of open-source Node.js libraries by the community, and simplifies installation, updating and un-installation of libraries. In the first part of connecting to SAP from Fuse 6.1 we showed how to use the Camel SAP Netweaver Gateway Component with a sample developer account and sample data. The Netweaver Gateway component is part of Camel as of 2.12. In this second part we examine using the Camel SAP JCo (Java Connector) component. This camel component is included as part of the Fuse 6.1 Enterprise product and is supported by Red Hat but is not part of the Camel community at this point. The diagram shows the technical schema of data conversion in the SAP JCo (standalone version). Starting from a Java application, a Java method is forwarded via the JCo Java API (Application Programming Interface) and an additional Middleware Interface to RFC Middleware, where it is converted to an RFC (ABAP) call using the JNI(Java Native Interface) layer, and sent to the SAP system. Using the same method in the other direction, an RFC Call is converted to Java and forwarded to the Java application. SAP provides SAP Java Connector as a standalone software component that can be installed independently of the SAP system. 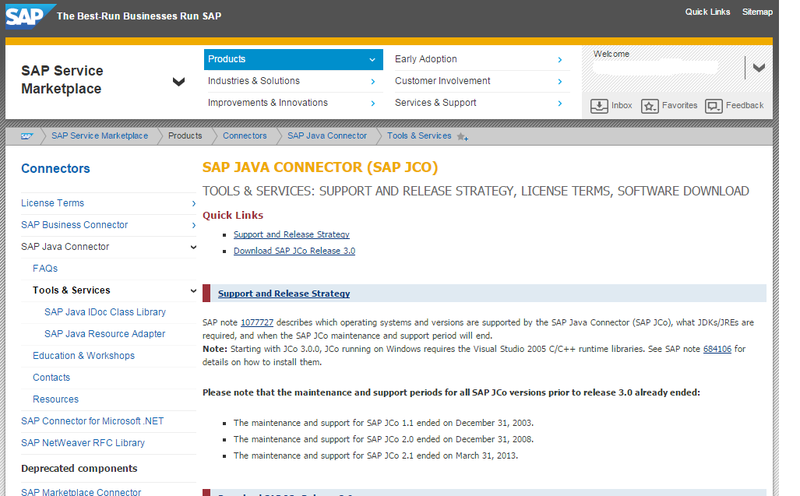 You can access the installation files at service.sap.com/connectors. In order to download the Java Connector you must have a S User or service account which is explained in this article. The SAP Component enables outbound and inbound communication to and from SAP systems using synchronous remote function calls, sRFC. The component uses the SAP Java Connector (SAP JCo) library to facilitate bidirectional communication with SAP. The component supports two types of endpoints: destination endpoints and server endpoints. You can find more on the Fuse 6.1 Camel JCo Component in the Red Hat documentation. We will give a quick comparison of the two components, discuss the demonstration setup and then show how to run the demonstration. For our sample we will start a timer that will fire only once, get customers, log them and then save the customers to a file. The Camel Route is shown in this diagram. Let's take a quick look at the setup of the project in order to use the JCo component. The destination: prefix designates a destination endpoint and destinationName is the name of a specific outbound connection to an SAP instance. Outbound connections are named and configured at the component level. The rfcName in a destination endpoint URI is the name of the RFC invoked by the endpoint in the connected SAP instance. The server: prefix designates a server endpoint and serverName is the name of a specific inbound connection from an SAP instance. Inbound connections are named and configured at the component level. The rfcName in a server endpoint URI is the name of the RFC handled by the endpoint when invoked from the connected SAP instance. The configurations for destinations are maintained in the destinationDataStore property of the SAP component. Each entry in this map configures a distinct outbound connection to an SAP instance. The key for each entry is the name of the outbound connection and is used in the destinationName component of a destination endpoint URI as described in the URI format section. Now we can look at our camel context. We start the route with a timer that will just run once. We use the sap component with the destination endpoint with the destination name NPLdestination. Then we use the rfcName BAPI_FLCUST_GETLIST that we populate in the SAP setup, which in our case is the cloud appliance described below. Once we retrieve the customer list from SAP we log the response and save the data to a file. The full source code is at https://github.com/jbossdemocentral/fuse-components-sap. But before we can run the Camel Context we have to setup the SAP Server with the data. So in our demonstration as we stated before we are using a Cloud Appliance. You will see the Camel Context start with the results below. You can turn on trace to get more information. You can view the BAPI_FLCUST_GETLIST.xml file to find all the data returned from SAP. This article will help you setup a SAP Cloud Appliance with a SAP Netweaver Application Server ABAP 7.4 on SAP MaxDB [trial edition] instance running on AWS so you can test the JBoss Fuse Camel JCo Component. An example usage with Fuse is in this article. For more information about specific questions for the AWS cloud provider for SAP, see the FAQ. Choose Account then Security Credentials. To see your access key, choose the Access Keys tab. To see your secret key, choose the Secret Access Key tab and then choose the Show link. The virtual private cloud parameter (VPC) VPC is needed to be configured in the AWS location US-East (Virginia). 3. Add the solution and in our case we chose the SAP Netweaver Application Server ABAP 7.4 on SAP MaxDB [trial edition]. 5. Now we can connect to the SAP system and add the sample data. You can click on connect under operations which will bring up the access point. You can click on SAP GUI (NPL,001,00) but before doing so you need the SAP GUI in order to connect to the instance. You can get the SAP GUI from the service marketplace or from the appliance with ssh/scp. You need a SAP GUI 7.20 Patch level 9 or above. You have to copy the according file to your computer and start the self-extraction. You have to copy the according file to your computer, unpack the archive and follow the installation instructions. 3. Get a “Minisap” license at http://www.sap.com/minisap . As system ID choose NPL - SAP NetWeaver 7.x (MaxDB). 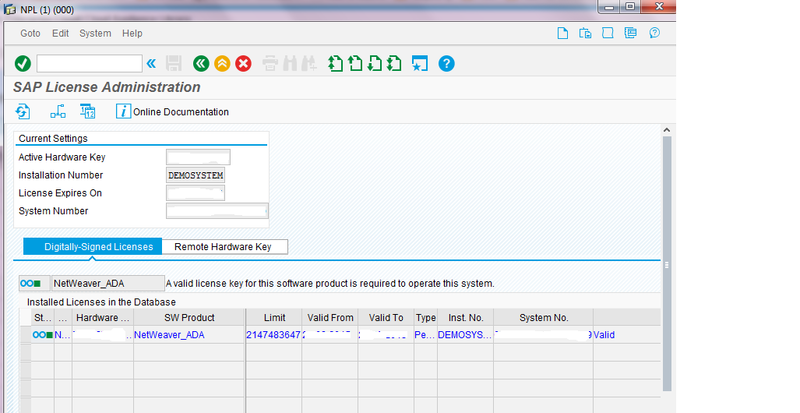 As hardware key use the hardware key shown in transaction SLICENSE. 4. Click “Install new License” under edit and select the downloaded license from step 3. 5. After license installation call transaction SECSTORE and run a check for all entries using F8. This is needed to enable RFC after the change of the installation number from INITIAL to DEMOSYSTEM. Installing the Minisap license will change the installation number from INITIAL to DEMOSYSTEM. The developer access key for user DEVELOPER and installation number DEMOSYSTEM is already in the system and you can start developing in the customer name range (Z*, Y*). Now we can create the data on SAP.